What is the Best Deck Stain? Can you Stain over a Painted Deck? See here for a more in-depth article on staining new wood. 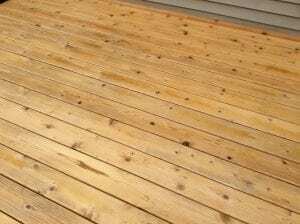 This article is the top rated and indexed article on staining new wood decks. It is important to consider the state of your wood surface before staining, especially this Spring 2018 following such a harsh winter with extreme temperatures. Preparing to stain a new deck is considerably different from staining a deck that has already been stained. It is important to follow some guidelines that lay the foundation for an optimal wood surface to stain. Before diving into a wood stain project, we recommend you conduct your own research, read articles, and watch how-to videos to educate yourself on what is best for your wood deck. The plethora of resources that are available in 2019 will help you tackle your wood stain project from the right direction. Feel free to browse deckstainhelp.com or Google the brand of your stain for specific tips about the deck stain of your choice. Let wood weather for 1-12 months after installing. This is a wide range, so make sure you read the manufacturer’s recommendations for whichever stain you choose to use. After the allotted waiting period is complete, properly clean and brighten your wood to remove mill glaze, dirt, grime, mold, and UV graying. Let the wood dry for a few days prior to staining, unless the stain brand specifically says it can be applied to damp wood. Apply 1 coat only of the stain! Overapplying will not allow the stain to properly penetrate the wood grain, producing results that will not last as long. Ensure proper care of your stained deck by applying a maintenance coat in 12-18 months. Every 2-3 years after that. Note Rough (Sawn) Cut Wood: Rough sawn cut does not need to be weathered or prepped. This wood is very porous and can be stained right away after install. You see this wood type on fences and vertical wood. Rarely on the decking. Be sure to check back throughout 2019 for more suggestions on how to improve the longevity of your deck stain project. If you have any suggestions for prepping new wood, feel free to leave a comment below. Please Rate This. You may also post comments or ask questions below. We have a pressure treated deck that is 12 months old. We live in New England and it is in the 50’s during the day and 40-30’s at night. Should I wait to stain in the spring or can I stain it now? Also what type of stain would you recommend for a dark semi-transparent stain? Wait until Spring. Clean and brighten the wood for prep. Try Restore A Deck Wood Stain in Dark Walnut or TWP 1503 Dark Oak. It is now October and the wait time of 3 months is not going to work as the temperatures are too cold and snow can be a problem in Alberta climate. Should we wait till the Spring 2019? or treat with something right way? For a number of reasons I wasn’t able to get my new cedar decking installed until now (mid October) outside Milwaukee, Wi. Temperatures are already down to daytime highs in the 40’s and lows at night in the 30’s. Is it even possible to apply a protective product under these conditions? How much more work will result if I do nothing to the wood until spring? Yes, you need both a deck cleaner and then a wood brightener. Reside in Nashville, TN. I have a brand new deck – about 4 months old – of pressure treated pine. I tried Behr Transparent Cedartone Stain & Sealer on samples(floor and rough sawn privacy fence) and it’s the exact color I want. Now, after spending 2 hrs on your site, I won’t be using the Behr! Go figure. 1- Do I need to clean & brighten it B4 I stain since it’s so new? All of your top rated cleaners/brightening have information about existing paint/stain/etc. already on the wood. If I need to clean/brighten – what brand do you recommend? 2-Looks like you’re best stain recommendations are TWP or Armstrong Clark. Are these a stain & sealer? 3-I want to spray on my stain. Is a pump-sprayer a reliable method, over rolling or brush? 1. Yes, you have to prep. A deck cleaner will not remove any Behr stain though. You would need to sand the sample spots off then clean and brighten the wood for the prep. 2. Yes, deck stains are sealers as well. 3. If you spray you will need to back brush/pad to ensure it is applied evenly and soaks in. I just finished yesterday a 220 foot cedar fencing with pressure treated post in Washington state, what is the best stain to use and how soon can I stain it? I wanted to do it before the rain comes. We have a full week of sun and warm temperatures ahead this week and was hoping to stain next Saturday, any thoughts? I do have sanded four sides top caps and fence rails. thank you for any help on this. Is the fence wood smooth or rough sawn cut? This will determine if you can stain now or if the wood will need to season. Its rough cut western red cedar, treated post, and sanded 4 sides top cap and fence rails. You can stain now. No need to prep as long as the wood is clean and dry. Try Armstrong Clark or TWP 100 Series. Any local suppliers in the greater Seattle area for the stain you recomended? You would have to contact them directly for help. We just completed a 300 square foot new cedar wood deck. We are wondering when to apply deck stain and best stain to use. We want to maintain the natural look of the wood so thinking of Deft Extreme semi-transparent clear color. Your thoughts?? Wait 3 months and prep before applying the Defy Extreme. I used RAD to clean & brighten my deck. I stained with TWP, only to find my perfectly sunny day ended with rain. I think it’s okay – it was quite hot, sun was intense, and stain seemed to be soaking into the wood really well. The rain also beaded up, so that’s a good sign. But it’s been raining off and on for a week now. This is a 12-mo old deck, first time staining. Q: the stain is a bit uneven. Where there are knots, I couldn’t get the light-gray color completely power washed off and I didn’t have it left in me to sand, so those spots are light colored. Other areas accepted more stain and are darker, etc. Is there ever a situation where you should apply a second coat? Or even in spots (over the knots)? The TWP can said 2 coats, but I only did one because 1) your site recommends it and 2) it’s all I had time for before the rain. And if I can do a second coat/ spot coat, is it okay to apply 1-2 weeks later? Knots are always lighter in color. That is normal. Best to not do another coat now but late Fall or early Spring next year. We installed a pressure treated wood deck two months ago. It is already splintering and cracking. The deck gets full sun in the morning and light shade in the afternoon. We would appreciate a recommendation on what would best the best stain to use. I have been reading different sites and am very confused. Thank you for your help. Ask Deck Help Questions & Post Product Reviews! Please post a review in the Consumer Star Ratings below each Article. The Comment Area Below the Articles are for in-depth reviews and any questions you may have on each topic. You may post pictures here as well. What is the Worst Deck Stain? This is first and foremost a help site from our experience as wood restoration contractors. All stain and prepping manufacturer directions were followed with our reviews and ratings. We offer no guarantee of similar results. Take in consideration that wood and deck stain results may differ due to prepping procedures, different wood types, exposure to UV radiation, natural weathering, etc.